Our directions will help you find us. We are located in Atlanta, Georgia, in the heart of the city. On Sunday morning we usually have 110 – 130 people in Church, about a third of them children. 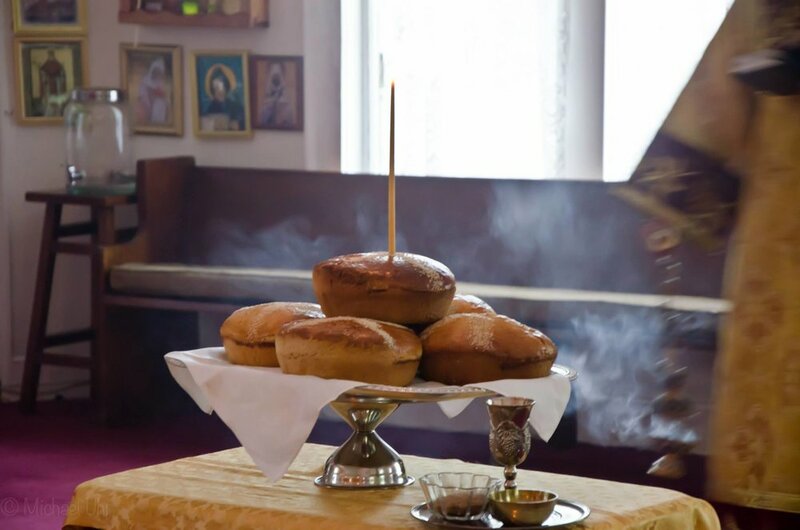 The beauty of Orthodox worship must be experienced to be understood. The Divine Liturgy expresses the entire Christian faith in a continuous song of praise and prayer addressed to God. It is focused on God, not on us. There is nothing just for amusement or entertainment. Since much of the service is the same every week, worshippers know it and can participate personally, either by singing along or just by prayerful attention. Worshippers are surrounded by icons (pictures of Christ and the saints), which remind us that we are participating while on earth in the worship of all the angels and saints in heaven. The entire service (except for the sermon) is sung, mostly to Russian chants and melodies. No organ or other instruments are used. The words are all from Scripture or ancient Christian texts — no rhyming metrical hymns are used. All our services are in the English language. Children — we do have a nursery downstairs. We also believe it is appropriate and beneficial for children to be in the services as much as possible. It may take a few visits, but young children can learn to settle down, and it’s surprising how much even toddlers absorb. It’s no problem if they move about quietly — we have a number of children ourselves and are used to some movement — but please be considerate and take them out briefly if they become very noisy, especially during the sermon. What are Icons? Icons are paintings of Christ and the Saints. Icons and crosses are kissed (“venerated”), but not worshipped, as a sign of our belief that in Christ God took a physical body, and became part of our physical world so we could know Him. Other human beings who unite themselves with Christ become holy and the image of God becomes visible in them so we honor their icons, as well.